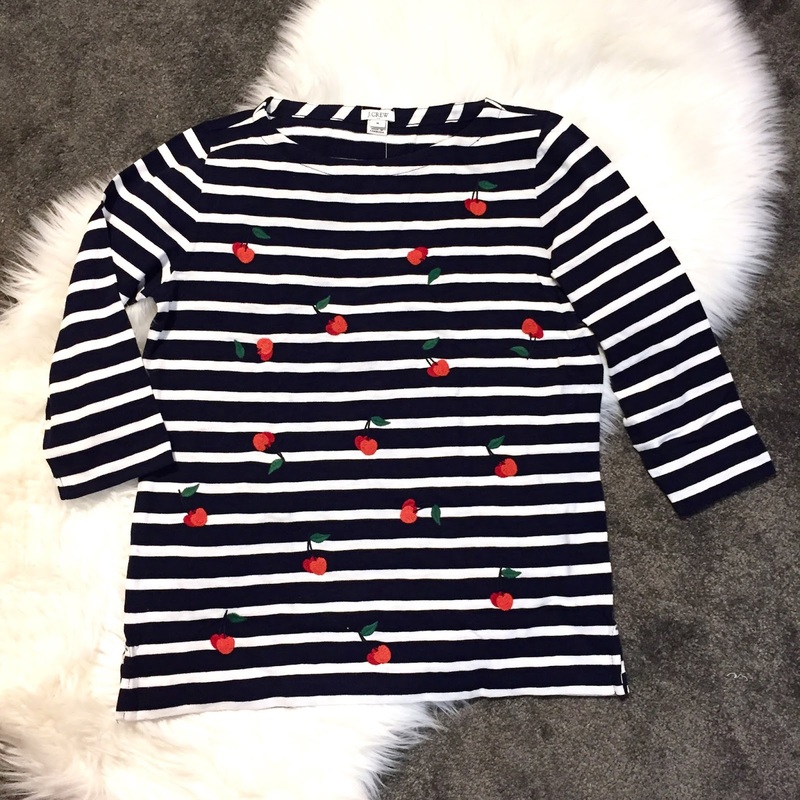 Ok, I realise I'm on a bit of a cherry kick lately, but it really is a cute fruit to adorn clothing and turn into accessories! 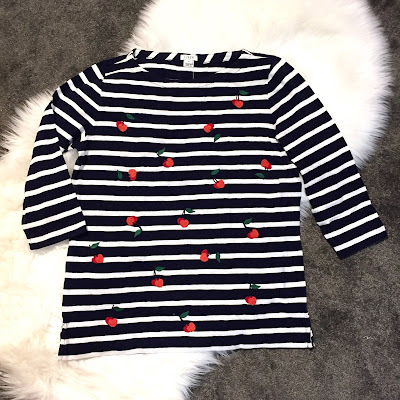 (Scroll down for another cherry item...) When I saw this sweater, I swooned. It is striped AND has embroidered cherries all over it! It was seriously made for me! On the website, the striped seamed more black, but are navy in person. I think I actually prefer the navy colourway! This is a perfect spring/summer layering pieces and I plan on wearing it in early fall as well. I've got to get the most out of my fruity clothing after all! 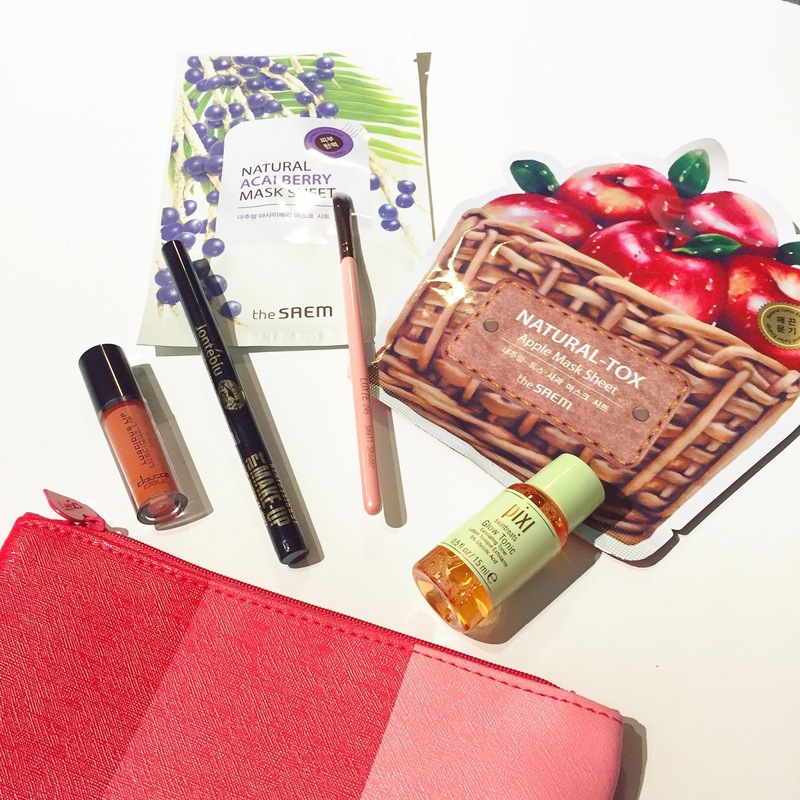 I've been anticipating my June Glam Bag because I didn't know which colour pouch I'd be getting. There are three different colours schemes for this month (red, blue and yellow). The three primary colours are represented as the theme is Pride for the month of June. I've been stocking Ipsy's Instagram page to spot the bags in action and they are all very pretty, I would have been happy with any colour, but the red/pink is gorgeous! This month, I was hoping to (finally) get a red lip gloss but was disappointed when it arrived. The colour is definitely not red but a very peachy peach... The image falsely represented the shade. Here's to hoping I get a red lippy next time! I was however very happy to receive another liquid liner (I seriously can't have enough), a couple sheet masks, an eye shadow brush and a toner. I can't wait to test out all of these goodies! Seriously, this bright pink package is the best mail I get all month! This week's post is brought to you by the colour red! Just kidding, but I'm just realising everything I'm featuring is red... Seeing as I clearly can't sit around and wait for Ipsy to eventually include a red lipstick in my monthly glam bags, I decided to go purchase one. 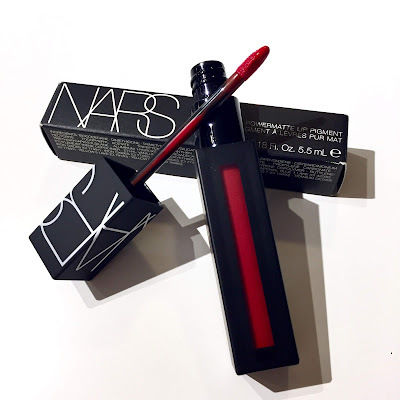 I was looking for a smudge-proof, long-lasting, true red shade for my upcoming engagement photoshoot. I had seen this brand of lipsticks featured by @maryorton (one of my fav bloggers) and had to try it out for myself. Well, I give it a big old two thumbs up! This stuff is great! I'm still trying to get the hang of the applicator, but I'm sure I'll get it with a bit of practice! 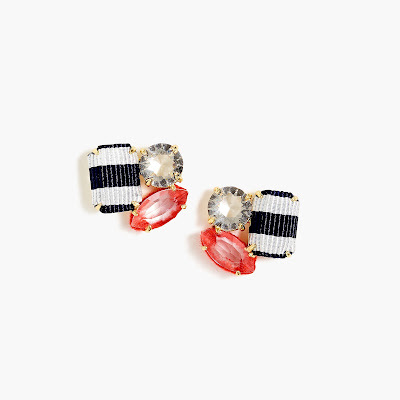 I am currently crushing on these nautical-inspired earrings at J. Crew. The little striped bead combined with a white and red stone. I mean how cute? Plus, they are a cluster style, which I love wearing. They make more of a statement than a stud, but not as much as bigger pendant-style earrings. To me, hey are the Goldie Locks of earrings! I can totally see myself getting a lot of wear out of these earrings. They're on my wishlist, and I'm keeping an eye out for a sale! 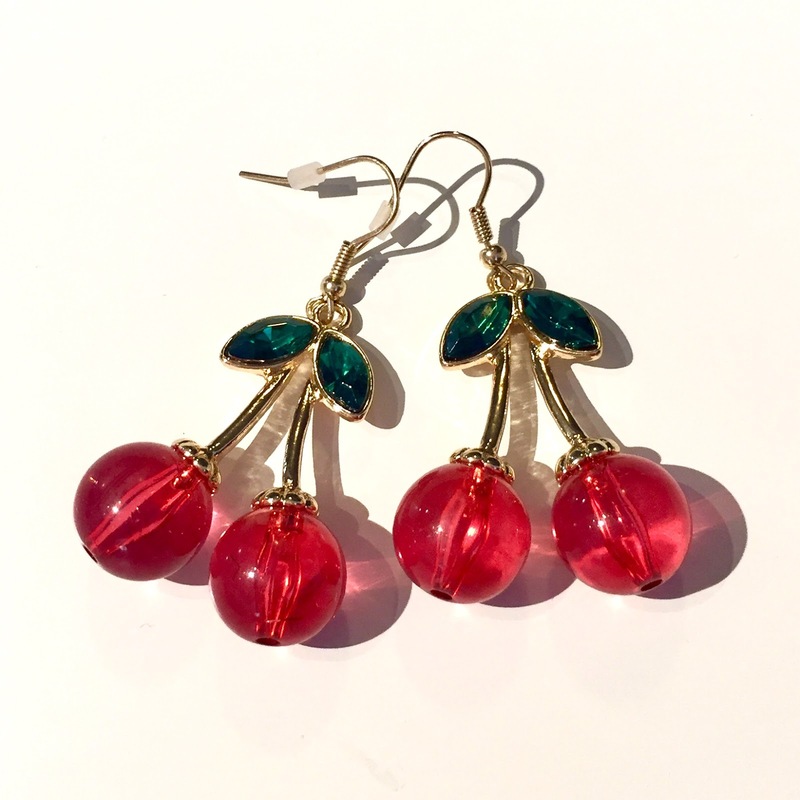 As teased above, here are the cherry earrings! They are beyond adorable! I also like how they are just big enough that you can make out what they are, but are light-weight. I definitely plan on wearing them with matching cherry-printed clothing, but they will also be nice touches to add to any red garment as well. The possibilities really are endless! Be prepared for an overload of cherries because these pretties will be on repeat all season long!